Rajmachi has been one eluding dream ride for me. Every time it had been planned by the Inddiethumpers, the guys I ride with, for a reason or two - I couldn’t make it. So, this time when it was planned on a Saturday night, I took no time to confirm my attendance! Rajmachi is a small village, some 15 km from Lonavala – a famous tourist destination. It’s a well-known 15km easy trek. 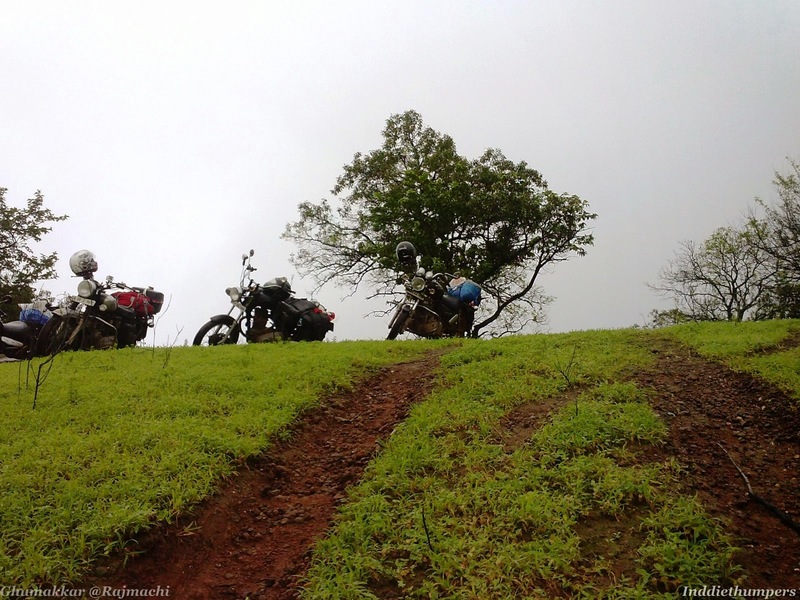 But, the real adventure is to ride to the village, and so Ride to Rajmachi has always been a dream ride for the Riders. As planned, Inddiethumpers started gathering at Nerul Lake. Bruce, Joshil were first to reach, I joined later and then came Vikram Pai-Untamed, Sagar, Malik, SP, PP, Rahul and Jackson & Dinesh. Gaurav, the man who brought coal for us, joined us at Lonavala. At Inddie Specific Time (+2 hours to scheduled time), we finally kicked start the ride only to realise rear tire of Sagar’s bullet was flat. An hour searching the right guy and getting the tire done we finally left Navi Mumbai at around 11PM. Taking care of few minor breakdowns en route and a continuous rain we reached Lonavala and raided a roadside teashop for n-number of teas, Maggi and egg-bhurji. Devouring the delicacy, which was multi-folded thanks to hunger pangs we had, we found Jackson’s front tire flat this time! 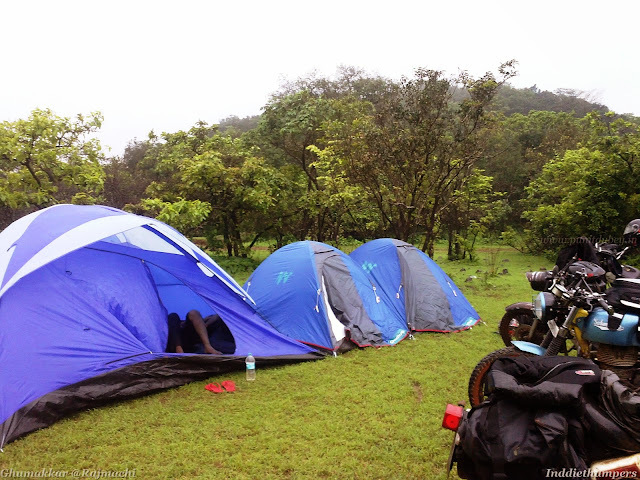 Another hour or so, and we were all ready to start the off road ride to Rajmachi at 0340 hours. Veteran Bruce, Ganesh, Malik, Sagar and others had lots of stories to tell us about Rajmachi ride, like those brat kids on a jeep who took a sharp turn and met the ditch and that Gypsy carried away by the stream later to be pulled by some 17 guys. 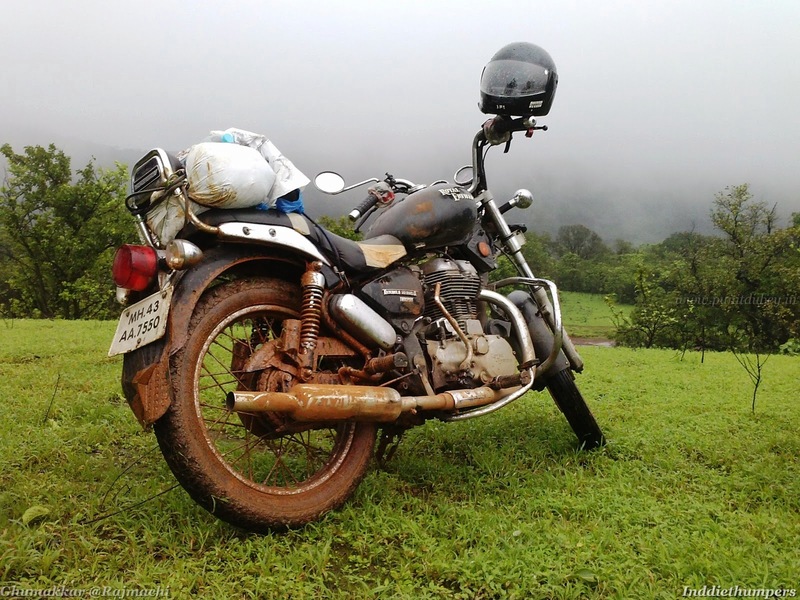 As the ride started, leaving NH4 just before entering Lonavala towards Della Adventures – a concrete road welcomed us. Soon after crossing Della, it converted in to a loose gravel road which morphed into no-road pathway after a few kilometres. It was dark and headlights were the only source of light, thanks to cloudy night. We were following each other jumping, maneuvering and managing our bulls on a real bumpy road which couldn’t be seen but just felt. At around 0430 hours we reached our first stream, Bruce was first to cross it and have a feel of depth and energy. He crossed it successfully and we found that over a feet and half deep. One after one the troop crossed the stream and left for the rocky yet slippery mud laden curves. 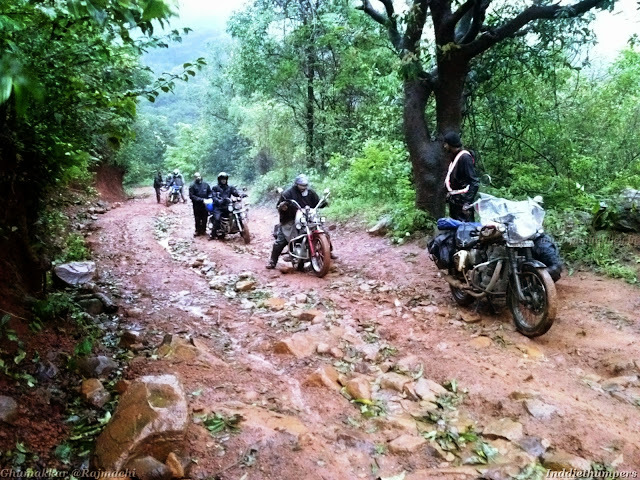 Bumps and rains kept bringing the bullets to edge; solving minor glitches that kept on coming we reached another stream that was deeper and furious than the earlier one. Sun had already started rising and we were again put on task to cross this about 2 feet deep and some 20 feet wide stream with a human chain to support the rider across. This one stream took about an hour to cross. Final obstacle was a slope, at an angle of about 45-60 degrees and no friction support; it was one drift ride of life time! Jackson turned out to be the only guy who crossed this monstrous obstacle without being pulled or pushed. Malik played dare devil a little later and got stuck in a over a feet deep sticky mud, an hour spent there pushing, pulling and revving his Liger out of it. Hell tired, we could reach and zeroed upon the camping site finally by around 1030 hours. 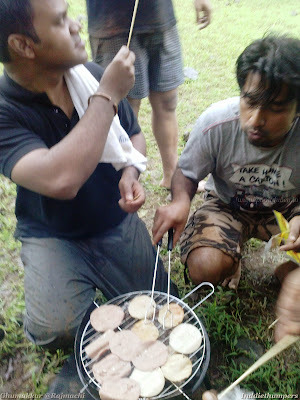 Tents were pitched; barbeque set up and the guys fell dead for thirty minutes or so after a sumptuous meal (variety of meat for NonVeggies and munchies for Veggies!). We left the place at around 1200 hours on roaring call from Bruce assisted by an irritating mockery by Ganesh. 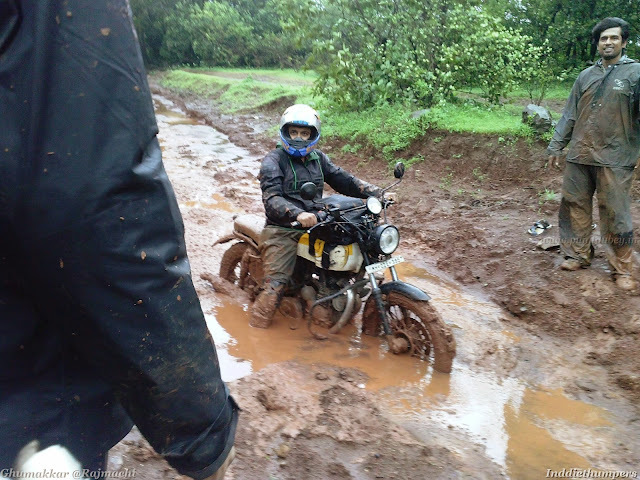 Manoeuvring break-clutch-gear of our ~200 kg monsters through the slippery descend and then two streams – which have swelled up a few more centimetres by then – we could reach Lonavala only by 6 PM. Racing against the rains, of course with due respect to safety, we called it a ride reaching Navi Mumbai at around 8PM. Bruce asked me how was the ride, I took deep breath and replied, "One of the BEST RIDE OF MY LIFE!" Like all the rain-rides, a heavy rain welcomed us on Palm Beach, bidding adieu we all left to our destinations. Mumbai to Lonavala is a well maintained NH4 road - quite an easy ride. But don't try to stunt, respect the road and the curves! 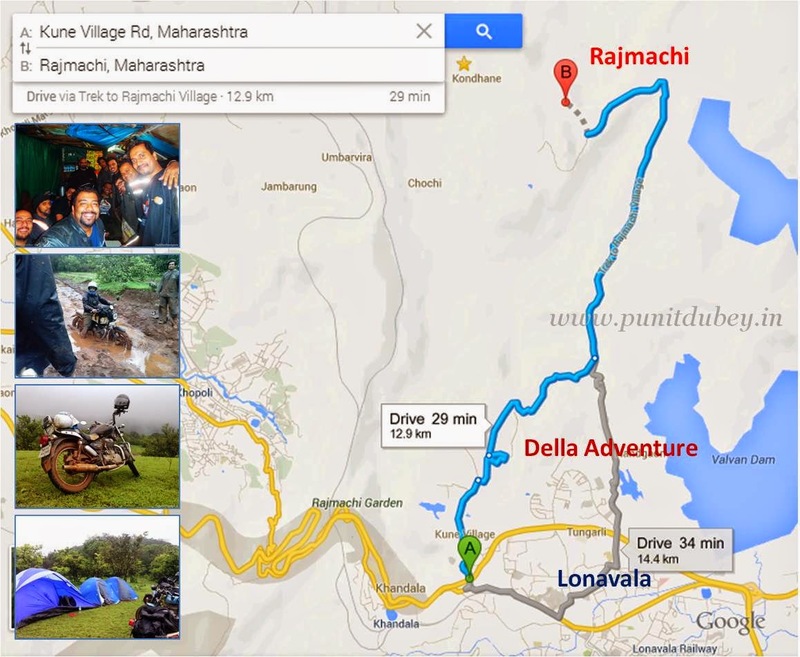 Lonavala to Della Adventure is a concrete road, there is either a lose gravel road or no-road from Della to Rajmachi. Rajmachi is one ride made to test the adrenalin. Never ever try to do it solo specially during monsoon. Always carry complete toolbox with spare tubes and all and any spare you may ever need. Don’t abuse the nature, a little care will keep the adventure alive for years to come. Wow Punit. Videos and your journey gave me goosebumps. Looks like a very cool group. And awesome bike shot dude! !